Membership definitely has it’s privileges. When you subscribe to The Nourishing Home, you’ll receive a whole host of benefits including my free weekly GF Meal Plan Kits, as well as exclusive subscriber-only recipes, meal planning tips, healthy living resources and MORE! Ready to Make Getting Dinner on the Table a Whole Lot Easier? Then be sure to subscribe to The Nourishing Home! As a subscriber, you’ll receive my my new gluten-free, grain-free meal plan kits that make it easier than ever to click-over to the recipes featured in each delicious family-friendly menu. 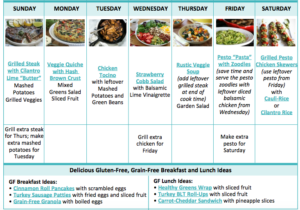 • Prep Day Chart featuring helpful tips and recommendations for prep-ahead tasks that make putting healthy meals together a snap! Special Gift for Subscribers Only! 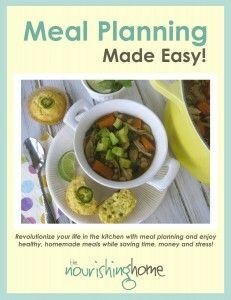 As a subscriber to The Nourishing Home, you’ll also receive a complimentary copy of “Meal Planning Made Easy” ($7.95 value). Revolutionize your life in the kitchen with my easy, step-by-step meal planning system that will help you to better nourish your family with the awesome added benefits of saving time, money and stress! And you’ll also discover proven prep ahead strategies and “Cook Once, Eat Twice or More” tips that make getting a healthy meal on the table a snap! All you need to do is either click here to access the subscriber form, or fill out the form located below with your email address. Then, be sure to *confirm your subscription (that’s really important!). Once you’ve confirmed your subscription, you’ll automatically be directed to my Subscriber Extras page where you can download the current month’s meal plan kits and grab your free Meal Planning Made Easy eBook. Then, each Thursday, you’ll receive my weekly email newsletter, which always includes a new healthy whole food meal plan kit. Enter your email address to subscribe to The Nourishing Home and receive healthy gluten-free, grain-free meal plans, recipes, health living resources and MORE delivered straight to your inbox for FREE! Remember, as a subscriber, you’ll not only receive these FREE Weekly GF Meal Plan Kits – you’ll also become part of my special subscriber community. 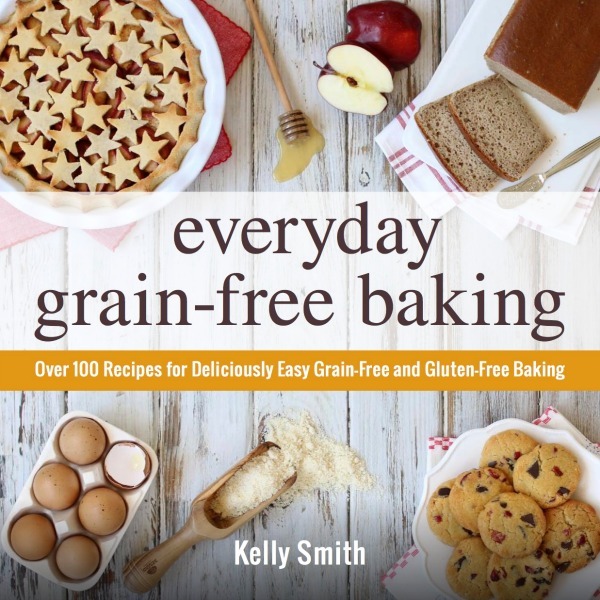 So in addition to my free weekly meal plans you’ll also receive the latest grain-free recipes, and lots of special tips, resources and encouragement to help you and your whole family on your journey to living a more nourished life! *Please note: The first email you will receive after you subscribe is a confirmation email. It’s important to confirm your subscription in order to receive the meal plans. So if you don’t receive an email in your inbox shortly after subscribing, please be sure to check your spam folder as those silly spam filters can get a little overzealous at times.